WCRE is proud to have exclusively represented FMP Haddon, LLC in the leasing of 222 Haddon Avenue, Westmont, New Jersey to Viner Finance Inc., d/b/a Oppenheimer & Company. FMP Haddon, LLC recently acquired this +/-27,000 square foot three story office building to relocate their business headquarters. 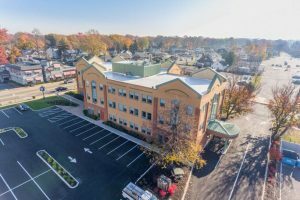 The property was purchased with 70% vacancy in a premier office location situated directly on the PATCO speed line in the quickly growing community of Haddon Township. With this latest lease transaction, WCRE is proud to announce 222 Haddon Avenue is now fully leased and 100% occupied. Viner Finance Inc.’s, subsidiary company, Oppenheimer & Company will be occupying 4,123 square feet. Oppenheimer & Company is a wealth and asset management finance firm that helps individuals, families, corporate executives, foundations and endowments, charities, pension plans businesses and institutions. Christopher Henderson, Principal & Vice President of WCRE exclusively represented the landlord in this office lease transaction.